Veneers and lumineers are very thinly shaped porcelain that is bonded to your tooth. The fact that they are very thin allows us to minimize the preparation of the tooth to create beautiful transformations of your teeth. This is very delicate dental work and we have 20 years of experience handling delicate dental procedures. Our experienced dental team can use the lumineer veneers to bring back your sparkling smile that you enjoyed when you were younger. Due to the fact that there is minimal preparation, there is often little to no discomfort in this procedure. The procedure requires one or two visits. We will use our gentle and delicate touch to deliver the sparkling results for your beautiful smile. 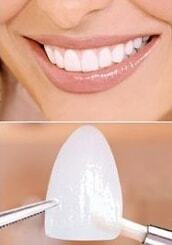 If you have a chipped tooth or an annoying blemish, you don’t have to feel embarrassed anymore. Stop hiding your smile. Visit us today to regain that sparkling smile you will feel proud to show off to everyone! Many dental insurance plans will cover the cost of lumineers. 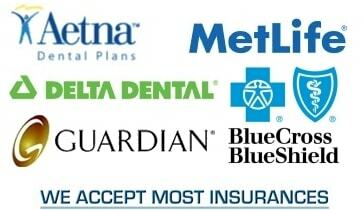 We accept most insurance plans so there is no reason to wait to fix your smile. Our office staff will can help with filing the insurance paperwork to maximize your dental benefits including for lumineers. If you contact our office we will be happy to double check your dental insurance so you can make the most of your dental benefits and know for certain what is and is not covered by your insurance plan. Give us a call today to see if veneers and lumineers will work for your smile!